My father led me to Africa. This is how my first African Jewish story began, almost fifty years ago, in Soviet Russia. My husband and I arrived in Serengeti, Tanzania, decades after my father recited aloud the passages from the Grzimeks’ book. 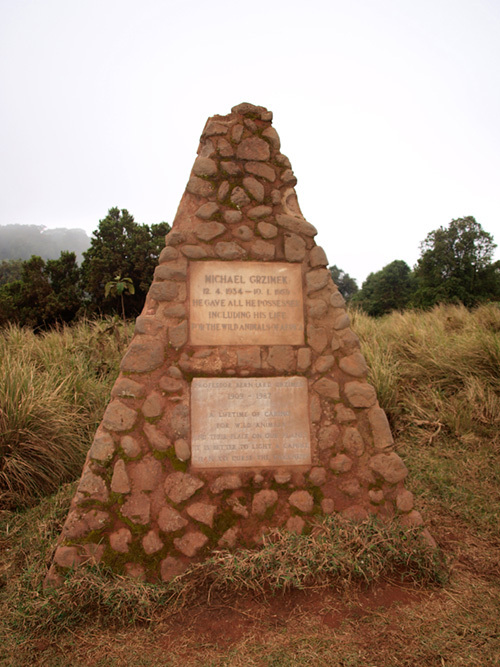 We found their graves on the rim of the Ngorongoro Crater: Michael, whose plane crashed there in 1959 when he was a few months shy of his twenty-fifth birthday and Bernard, whose ashes were brought from Frankfurt in 1987 to rest next to his son. Some time ago, studying the German response to the Holocaust, I learned that Bernard Grzimek did something else in his life in addition to saving Serengeti. He had been saving Jewish lives for years during World War II, while risking his own life: as a high-level official for the Nazi Food Ministry, Bernard Grzimek managed to provide stolen foodstuffs to Jewish families in hiding. When the Gestapo suspected him, Grzimek fled underground. As I tell the Grzimeks’ story to our friends who came with us to Africa, we can see zebras crossing the road, impalas grazing nearby, and baboons trying to figure out if we forgot to close the windows in our car. 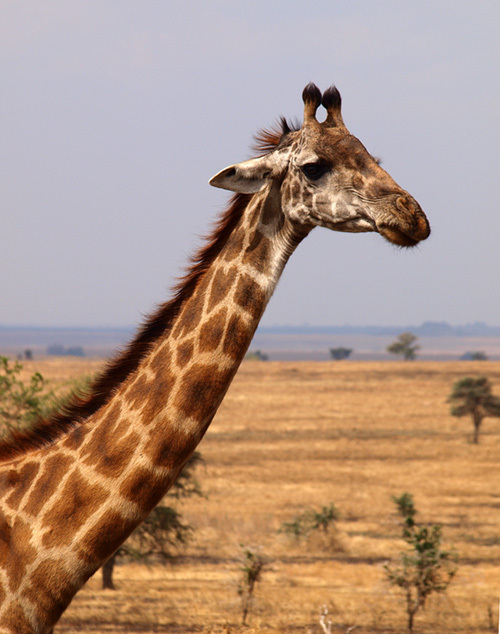 We are “among animals in Africa,” as my father called his dream world where all creatures roam free and as was the tile of one of Bernard’s books in my father’s library. 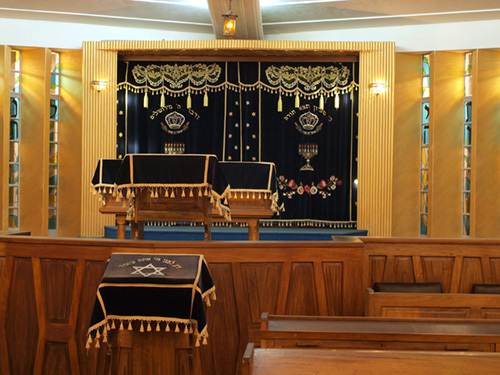 My second Jewish story of Africa began few months before our departure there, when almost in a jest I googled “synagogue in Kenya.” My grandmother used to say: “we Jews are – everywhere.” And indeed we are: there it was, a beautiful synagogue building looking at me from the computer screen as if saying, and why are you surprised, ah? I e-mailed the Synagogue and soon received a response from one of its leaders, Barbara Steenstrup. She later introduced me to Bunnie Gordon, who now lives in Maryland and serves as a Treasurer for the American Friends of Nairobi Hebrew Congregation. Both ladies told me their stories of what brought them to Kenya and how they found warmth and friendship among the Synagogue members which truly made Africa their new home. 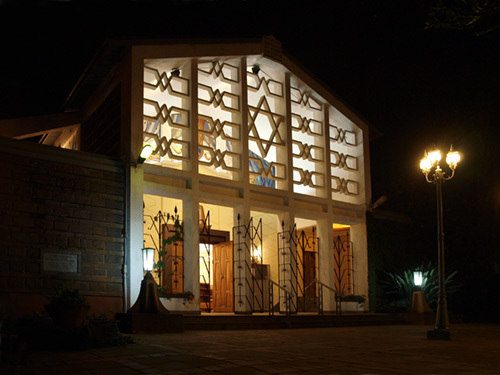 There, my new friends encountered a long-established and thriving Jewish community: in 2004, Nairobi Hebrew Congregation celebrated its 100th birthday and in 2012 – the centennial of its first structure. The Nairobi Jewish community is as diverse as the Diaspora itself: secular and observant, Sephardic and Ashkenazi, congregants come from India and Russia, Morocco and Poland, South Africa and the United States. Some are native-born Kenyan; the majority is from Israel. Some are from diplomatic corps; most are involved in various businesses. The very first Jew arrived in Kenya in 1900 during the construction of the British railroad, a project managed from India. So the first Jewish merchant also arrived to Nairobi from British India. His name was Markus, a Rumanian by origin, and he came to organize a supply of agricultural machinery for European farmers. The Jewish population doubled the next year when Michael Hartz arrived to establish his tinsmith business in Nairobi. More followed later, some from Ukraine and Poland, others from Germany and Austria, and in 1904 the congregation was established. The first Synagogue building was completed in December 1912. Never numerous, Kenyan Jews, however, were remarkably influential in the development of the country. Farmers and doctors, businessmen and lawyers, they helped to bring Kenya into the 20th century, and in spite of the open anti-Semitism of the British settlers, the Jews of Nairobi heroically served the Empire through two world wars. Anti-Semitism was officially displayed in Nairobi clubs and private schools: clubs had prohibitions in regards to Jewish membership and many private schools would not accept Jewish students. Public schools did, but gentile parents often would not allow their children to play with Jewish kids. Africa was not a safe haven from European Jew-hatred. The tide turned, however, during World War II, when the Nairobi congregation, closely working with the Jewish Refugee Committee in London, played a decisive role in saving countless lives of European Jews. The Board for Kenya Jewry, later named the Jewish Council for Training and Settlement, was charged with obtaining visas and looking after the refugees’ welfare. Vibrant Jewish life was demonstrated by dozens of various organizations and societies created over some hundred-plus years in Nairobi, such as the Relief Fund for European Jewry, the Zionist Association, the Jewish Cultural Society, the Board for Jewish Education, and many others. 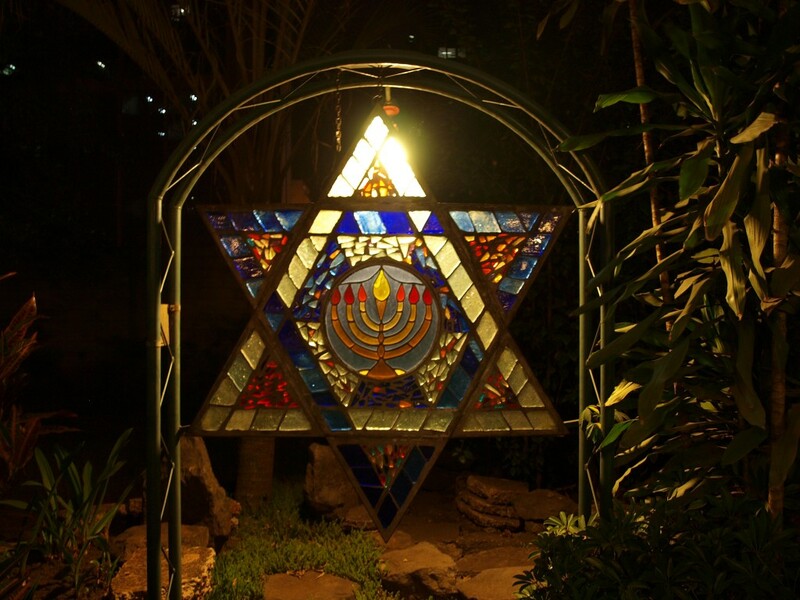 There are some devoted black followers of Judaism in Nairobi and it is known that there are hundreds of natives in Western Kenya who consider themselves Jewish. My grandmother would be proud. I found my third Jewish story of Africa in the most unlikely of places: the vast plains of Masai Mara and Serengeti reserves. As we drove there, we saw the light-skinned, tall, slender people dressed in red, who were as ubiquitous to the landscape as sky above and earth below. Surrounded by their herd of cattle, they leaned on their long spears or stood on one leg in a stork-like pose. Bearing remarkable similarities to ancient Romans from North Africa, most had classical profiles, wore red togas and sandals, and were equipped with Roman-style short stabbing swords. Women had shaved heads, while the young men’s hair was plated and stuck together with red clay. To us, they looked like young mythical gods. These are the proud Masai (sometimes referred to as Maasai) people of East Africa, whose mysterious past is enveloped in legends of being one of the lost tribes of Israel. When the Europeans brought the railroad to Nairobi, the Masai were the only human inhabitants there, coming and going as they pleased with their cattle. Nomadic and highly suspicious to any strangers passing through their land, the Masai were never fond of the Europeans. In 1904, M. Merker, a German official-turned scientist stationed in Tanganyika learned the Maa language of the Masai, earned their trust (or thought he did), and collected the legends the Masai cared to share. In these legends of origin, the Masai, according to Merker, maintained that their ancestors were slaves in the land of the Nile and escaped through a parted sea, pursued by a vicious ruler. Long before arrival of missionaries, Merker stated, the Masai knew the tales of Adam and Eve, and of Noah and the Great Flood, though under different names. “I regard the Masai as being descended from the nomadic Semites to whom the oldest Hebrew pastoralist belong,” pronounced Merker in his study. Lord Churchill called Merker’s Dei Masai “the most truly inspired investigation that ever an African people has had.” Merker’s study was well-known to the British Colonial Secretary Sir Joseph Chamberlain, who in the early 1900s suggested to Theodore Herzl, the leader of the Zionist movement, that parts of “Masailand” could be handed over to persecuted Eastern European Jews. In the following hundred years, most researchers concluded that Masai have Nilotic (from the river Nile) rather than Semitic origins, but Merker’s theory of Masai as “one the lost ten tribes of Israel” stubbornly continues to float in popular imagination. We arranged to go to a Masai village to meet them. They greeted us with singing and dancing, dressed in their best. Unlike other African tribes, the Masai refuse to modernize; they will not drive cars or wear western clothes. A couple of young men spoke enough English to communicate with us. When asked about their beliefs, they explained that the Masai believe in one God who they call Engai. Engai, they say, has two faces: the first face is a black color, kind and benevolent, bringing thunder and rain, grass for the cattle, and good life for the Masai; the second face is red and fearsome, bringing lighting and drought, famine and death. Engai made the Masai his chosen people and gave them the land of Africa. The word “Masai” is synonymous with “cattle,” these young people said. They translated a traditional greeting: “How are your wives and children and how is your cattle?” To own one without the other means being poor; to have an abundance of both is to be rich. Cattle do not just give meaning to Masai life, they are life. As we went around the village, we were told of the traditions curiously resembling those of the Jews: Masai would never eat meat the same day they drank milk; they consider that to be highly unhealthy to both people and cattle whose milk was drank. More important is their firm belief that the milk of the living animal should not be drunk in the village at the same time as the meat of the same animal is eaten. 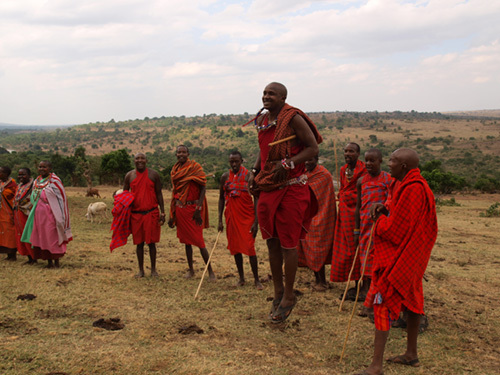 The Masai do not have chiefs. Instead, their lives are governed by the collective of elders chosen for their wisdom and moral qualities. Their assembly is called Sanhedrin and the round hut where they get together is called a Tabernacle. When a highly respected elder dies, he is buried in the ground facing east. Every passer-by places a stone on the grave as a sign of respect, and after a while a small hill appears on the landscape. All the Masai wear bright jewelry with colors symbolizing the Masai universe: red stands for blood of a slaughtered animal; white means milk that sustains the Masai; orange stands for milk mixed with blood, a drink that the Masai like and believe to provide strength and nourishment; green is the grass that feeds their cattle; and the blue is the sky above the Masai land given by Engai to his chosen people. I collected my fourth Jewish story in Africa at the end of our trip. We were traveling all day through the exotic strangeness of the Zanzibar Stone Town to the Nairobi airport’s thick mess of people and suitcases, sickening smells, and deafening noises. Through the traffic and dust and darkness of the Nairobi streets, like a mirage in the wilderness, we saw a brilliantly-lit Jewish star. “Are you meeting with Barbara?” a voice asked. We were. Barbara Steenstrup, beautiful and smiling, was waiting for us on the steps of the Nairobi Hebrew Congregation synagogue. It was too dark to see the garden surrounding the building but we could smell it. It felt almost divine. For the first time that day, we deeply inhaled and smiled back. Barbara gave us a detailed tour. I had read the book she sent me about the history of the congregation and I studied the synagogue’s website. But to step into that beautiful building, live, was entirely different. There was something in the main sanctuary’s colors of warm wood, bright blue, and gold that warmed my heart. I could not believe that here we were, in the shul right in the heart of African darkness, but it felt so familiar at the same time. Barbara treated us to a delicious fruit cake and coffee. We met the synagogue’s facility manager, a delightful Kenyan, Aggrey Muchene. Two travelers from Cleveland, Ohio, a Kenyan from a neighboring village, and a lady from Baltimore – we talked about difficult life in Kenya and our families, the recent devastating fire at the Nairobi airport and this beautiful synagogue. I thought about the meaning of a Jewish identity: expansive and inclusive, it may stretch much beyond what we think of as Ashkenazi or Sephardic. What is the Jewish Diaspora? I asked myself. Could it be simply defined as a removal from one’s homeland? There is something in us, Jews, I thought, a truly eternal people that moves us, no matter where we are, to always create a space of cultural solidarity and expression of community. A home away from home. Even when we are in Africa. The author expresses her deepest gratitude to Usha and Raj Ahmed, owners of the Chicago-based Exotic Journeys, Inc., whose knowledge of the region and organizational and professional talents have made all the contacts and connections possible. Thank you for sharing your stories. My fiancé and I would like to be married in the Serengeti and I wonder if you found any rabbis in the area that we could call upon to officiate the ceremony?